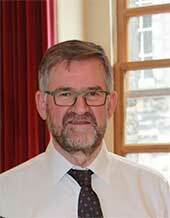 Bernard Meehan’s research focuses on insular manuscripts, history and culture, sixth-ninth centuries; and history and manuscripts of Scotland and northern England from the Norman Conquest to c.1200, with excursions into modern literary and archival subjects. Currently working on a comparative study of early medieval art in Scotland and Ireland; on the art historian Françoise Henry; and on an early 14th-century compilation of historical texts from St Mary’s Abbey, Dublin (TCD MS 11500). 'Durham twelfth-century manuscripts in Cistercian houses', in Anglo-Norman Durham, eds. D. Rollason et al. (Woodbridge, Suffolk, 1994). 'Notes on the Preliminary Texts and Continuations to Symeon of Durham's Libellus de exordio', in Symeon of Durham. Historian of Durham and the North, ed. D W Rollason (Stamford, Lincs, 1999). Last updated 4 November 2015 medieval.history@tcd.ie (Email).